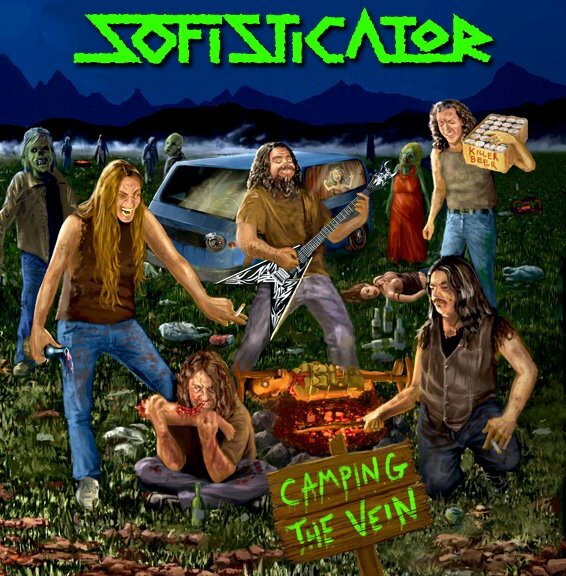 Sofisticator combines old school Thrash to the likes of Anthrax, Metallica, Megadeth etc… Formed in 2009 and starting their gigging in 2010, they use all the common techniques from the best of thrash from Speed riffs, to Two-Handed Tapping. ‘Burger Hell’ is typical of most thrash tracks, using high octane riffs and melodic blast beats. The vocals are so heavy that in places you’re not sure if he is actually throwing up or not. Into the solo sequence and you’re given a blast of two handed tapping licks mixed with over-the-top sweeping which really makes no sense musically, and then back into the mania of the music once more. Although the music is well written you get lost behind the punk/thrash vocals which are over demanding and take up most of the stage. The further you progress into the album, the faster the songs get, ‘Holidays in Hell’ attacks the brain with an alternative speed picking intro, not far from that of everything else. The solos again are nonsensical, just put there because it seems that there “Must” be a solo somewhere. Back into the vocals, which are really starting to annoy me, and into a good breakdown of metal riffs which is nice to hear finally. ‘Thrash & Clean’ has some good metal riffs which really show what this band can do; it’s just a pity it has taken 10 tracks to get here. With a mix of solid metal and vocals which finally sound as though they’re correct for the music this is a good track. If you are a huge fan of old school thrash then this will probably not be your thing, however if you are wanting something different that combines old school thrash then you might like this.